I took a little time this morning to make some much-needed Patreon updates, including a WHOLE NEW TIER! 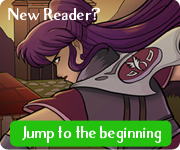 Free for all: My Patreon's going to continue to be a feed of comic content I create: my mini-comics, my on-going worldhopping adventure graphic novel Sombulus, my webcomic podcasts, my convention swag and news, and maybe some other stuff too. $1: I love doing silly mini-comics, so if you donate any amount, you get to give me prompts and requests for subjects you want to see! I'll draw them as time allows. Don't make it weird, though, okay? $3: This tier gives you a little shoutout on sombulus.com with a link to your site or blog. Make sure to message me with what you want, because sometimes I'm bad about following up on this one. $6: Sombulus Fan Lounge! This will have my full collection of bonus Q&A Sombulus comics and sketches that usually end up as TWC votebait, as well as other secret stuff as I think of it. Feel free to ask questions about the characters or plot, or request sketch prompts of the Sombulus crew! $10: EARLY PAGES! I've been building up buffer on my hiatus because I REALLY want to offer this to readers on an ongoing basis. Right now, the deal is that you can see Sombulus pages one update before they're released publicly. 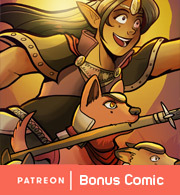 And since Sombulus is starting up again on April 25, the first page is going to go up here on Thursday! And hey, please let me know if you have any questions or let me know what you like and what I should do more of, and I'll see what I can do. I'll be putting up polls every once in a while too. I really want to make this a place where people can enjoy what I do. Thanks again for your awesome support, friends! See you back here next week for the start of Sombulus Act 7!